One of the most interesting features of Geoserver is its ability to manage a map server. In this article we will explain how to take full advantage of this feature. In the following image you can observe the two different operating methods for a map server. 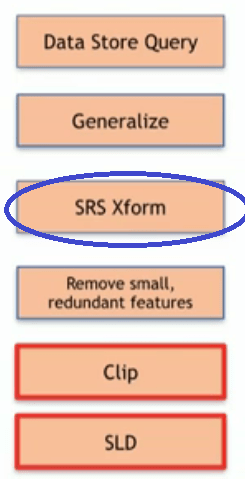 Everytime a query is placed, the server must query the database and formatting the data retrieved. The retrieval and formatting has taken place beforehand and just once.. When using this second configuration, only a simple calculation is needed to determine which images must be retrieved to the client application. This configuration is time and resource sensitive. A map is created in accordance with a formatting symbology, finally the image is cut in equal size tiles. This task has to be done just once. Each tile represents the formatted data and can be « served » very quickly. However, the only possible outcome is the display, it is not possible neither to access the underlying data nor to modify their format. On the other hand, if you zoom in the tile, the pixellisation will increase very quickly. 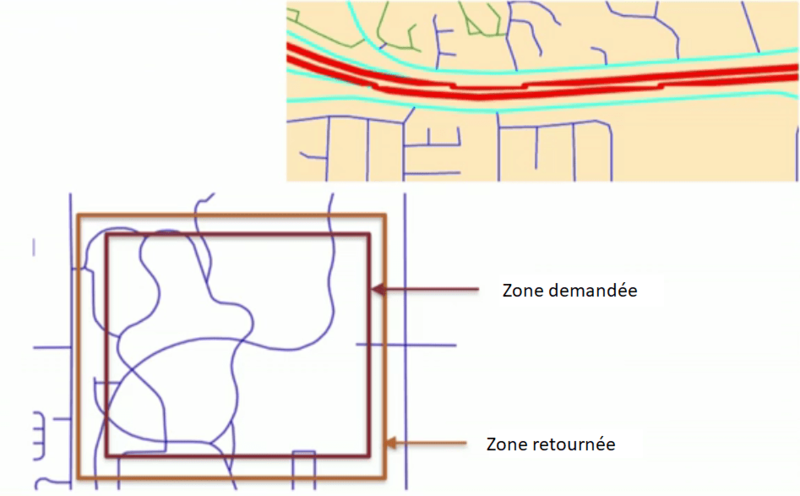 In order to solve this problem,you must create various maps, using different zoom levels. Each map is divided in tiles. At the time of receiving a query, the corresponding zoom level is calculated and the tiles pertaining to that level will aree used. Typically you usie 4 tiles at a time. The most detailed layer is divided in tiles, generally 256×256 pixels. The underlying layer formed by 2×2 tiles is calculated (when using 4 tiles of 256×256 pixels or more, just one tile is calculated). And so forth till the level where only one tile is found. 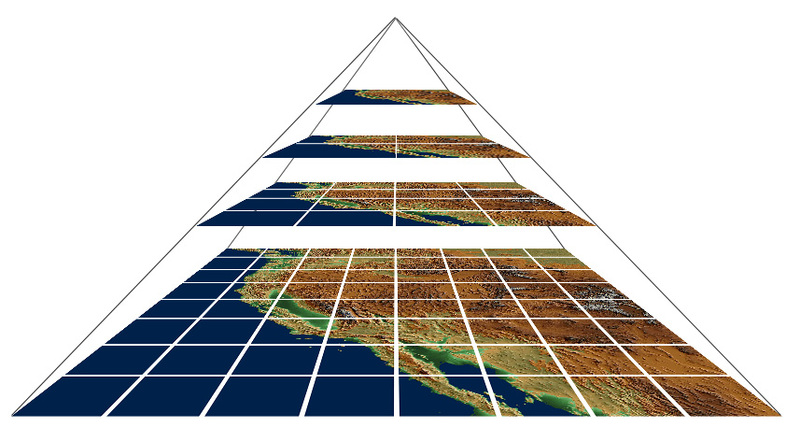 This set of layers is called a pyramid. Up to this moment we have been discussing a map server with images (raster). 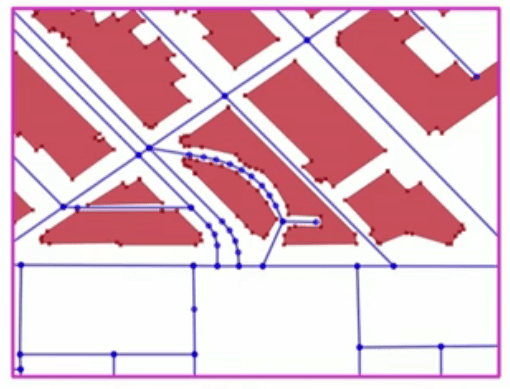 Even if the data from the database is vector data (Streets, buildings, parcs, etc) the final result is applied to the vector layers to generate a raster image, i.e., the outcome of the query. This type of service is called WMS (Web map service). Presently a new type of service has been developed. 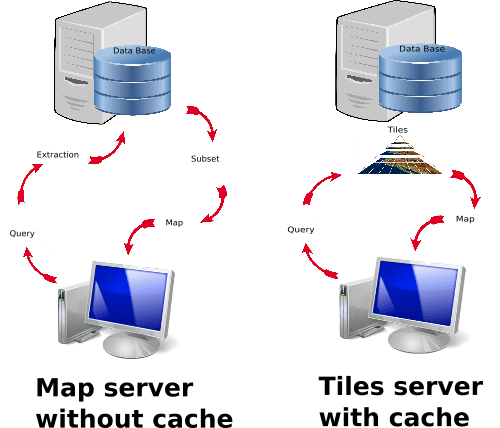 It allows to supply the data as tiles, the so called WMTS (Web map tile service).This service is included in gGeoserver to supply the data tiles as vector tiles. 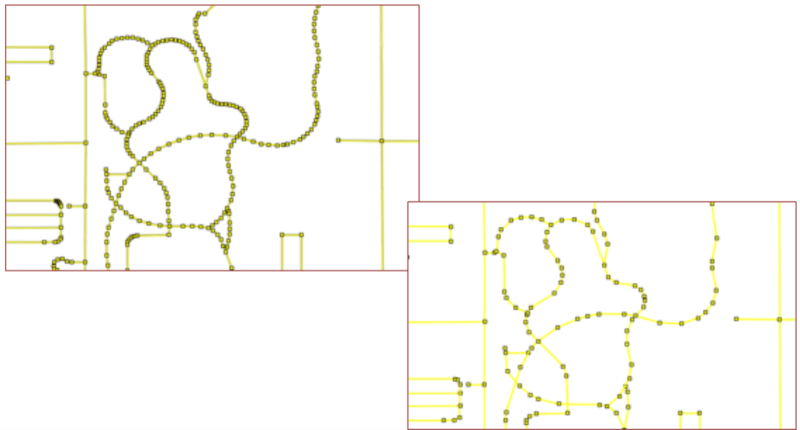 The space is divided in squares and the vector data (entities) corresponding to each tile is retrieved. 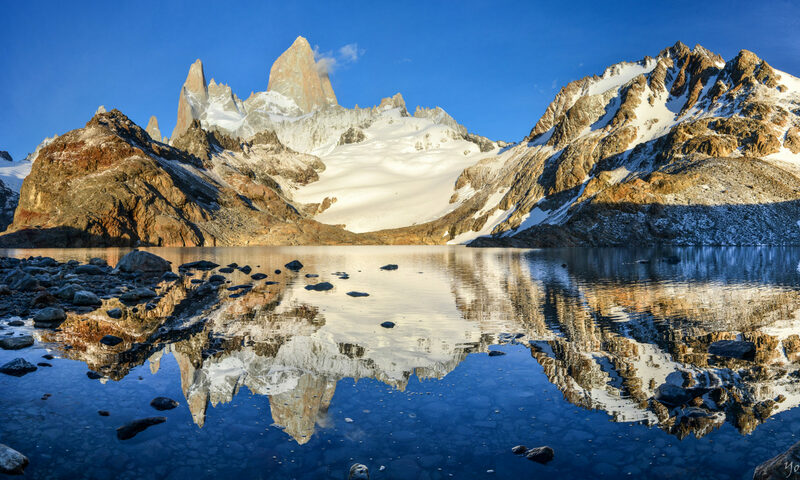 When receiving a request, the server proceeds as with the raster tiles : the adequate level of zoom is defined, and then the pre-extracted data is sent to the client application. The tiles creation process is the same whether they are raster or vector tiles. The first step is to retrieve the data that matches the query from the database. Almost always this data is the vector data (point, line, polygon). This is the data matching the entire available space, not just one tile. 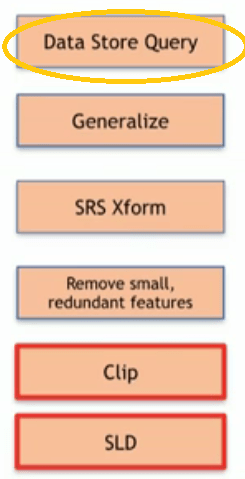 The second step refers to the so-called « generalization ». The process intends to store just the required level of detail needed for the zoom level preset, and, therefore, the unnecessary dots are eliminated. The third step is the creation of a file to translate the grid system used by the tiling into a system of coordinates. Geoserver uses grid sets or grid subsets. GeoWebCache does not recognize the referencing system. 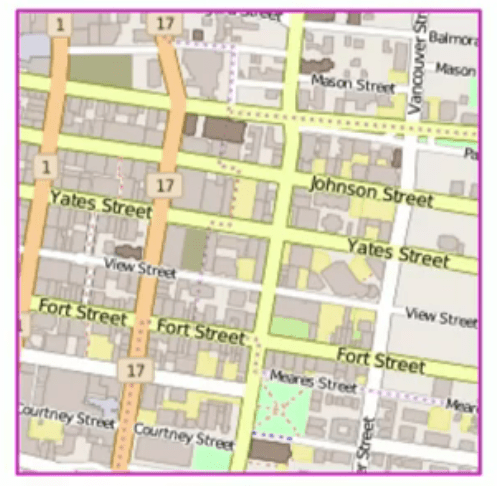 Since GeoWebCache sends a request to WMS, it uses the information grid set and subset to transform its internal tile index into a spatial request accessible for the WMS. The fourth step is a second type of generalization, but, instead of simplifying the geometries by reducing the number of points, it removes the features which are too small or superfluous. The step before last is the tile clipping. We haven’t yet applied the formatting. If we retrieve the exact required zone for each tile we could be missing the objects right on the joint of the tiles, as shown in the figure below. 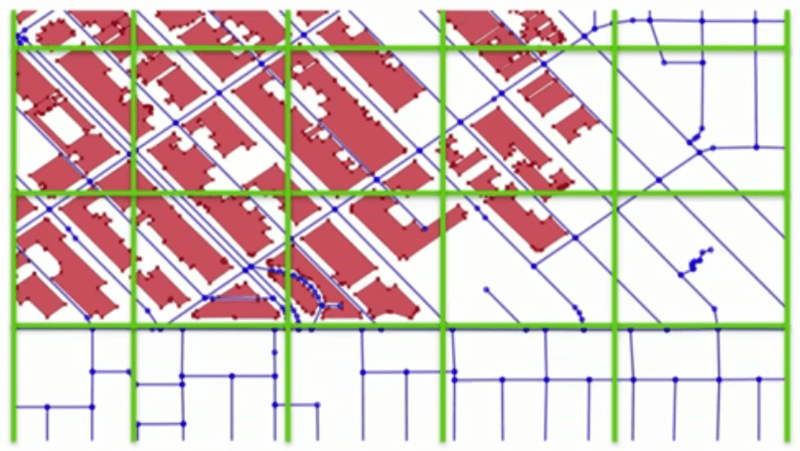 Geoserver uses a technique that reclaims a slightly larger zone than the demanded for the tile. This avoids those elements on the edges. This file shows which entities must be taken into account, which scale range must be displayed in the tiles, and which type of symbol must be used to represent them. The raster or vector tiles are supplied by the same service, the WMTS. Even if both types of data are supplied by similar methods, there are some differences. In comparison to the raster tiles, the vector tiles are formatted by the client instead of the server. For example, when using the OpenLayers app, you will only have the chance to display the raster tiles with their original form, while when using the vector tiles you will have total freedom to choose the symbols. One tiling alone can produce different maps. It must be added that, compared with the raster tiles, the vector tiles show an increased yield for the High resolution screens. As for the disadvantages, the use of raster tiles is easier than the vector tiles. In order to work with vector tiles you must have a deeper knowledge. You can conclude that it is more interesting to use the vector tiles service instead of the classic WFS. Both can return vector data without formatting, but the WFS returns the underlying data UNMODIFIED, while the WMTS returns the underlying data MODIFIED : ready to be posted. In the first case you have access to all the attributes of the entities, while in the second case you only have the attributes defined in the SLD file of the tiling. In the next article we will discuss how to set up the raster and vector service using Geoserver.